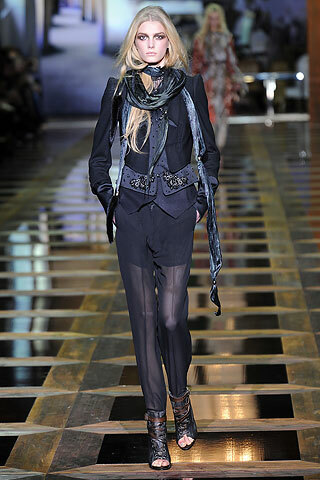 Yesterday I outlined the TRANSPARENCY trend seen on the runways for Fall 2010. Today I give direction on easy items to purchase or manufacture to cover this Fall trend. With all of the options that are out there, two key items stand out as investments. Both items were seen from a multiple of Ready to Wear designers and will be translated by many Contemporary designers for the season. If you are a shopper and want to stay ahead on this trend, I would start looking for these styles on the racks of vintage stores and boutiques. Vivienne Westwood showed transparent colorful leggings on the runway. The Junior market will most likely interpret transparency in this way at retail.